Interstellar dust clouds and glowing nebulae abound in the fertile constellation of Orion. One of the brightest, M78, is centered in this colorful, wide field view, covering an area north of Orion's belt. At a distance of about 1,500 light-years, the bluish reflection nebula is around 5 light-years across. Massive stars in our Milky Way Galaxy live spectacular lives. 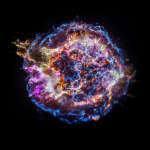 Collapsing from vast cosmic clouds, their nuclear furnaces ignite and create heavy elements in their cores. After a few million years, the enriched material is blasted back into interstellar space where star formation can begin anew. Galaxies are fascinating not only for what is visible, but for what is invisible. Grand spiral galaxy NGC 1232, captured in detail by one of the Very Large Telescopes, is a good example. Something very bright suddenly lit up the arctic -- what was it? The original idea was to take a series of aurora images that could be made into a time-lapse video. But when night suddenly turned into day, the astrophotographer quickly realized that he was seeing something even more spectacular. Based on its well-measured orbit, 3200 Phaethon (sounds like FAY-eh-thon) is recognized as the source of the meteroid stream responsible for the annual Geminid meteor shower. Even though most meteor showers' parents are comets, 3200 Phaethon is a known and closely tracked near-Earth asteroid with a 1.4 year orbital period. From dark skies above Heilongjiang province in northeastern China, meteors rain down on a wintry landscape in this beautiful composited night scene. The 48 meteors are part of last week's annual Geminid meteor shower. Welcome to December's solstice, first day of winter in the north and summer for the southern hemisphere. Astronomical markers of the seasons, solstice and equinox dates are based on the Sun's place in its annual journey along the ecliptic, through planet Earth's sky.